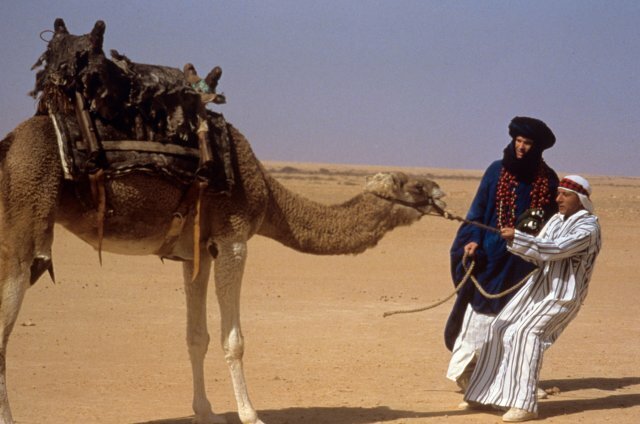 A rare appearance by Elaine May reveals details about Ishtar, May’s early beginnings, and whether the 1987 film will appear on Blu-ray. On Tuesday night, the 79-year-old Elaine May made a rare 92nd Street Y appearance, spending forty minutes poking at a severely undermatched bird who made the mistake of confessing that he didn’t have a whit of creative writing talent. “Are you, like, an interviewer?” asked May. The man may as well have told May that he was an alcoholic sitting at a bar doing his best not to order a drink. He confessed that he was a curator for the Museum of the Moving Image and that he wrote reviews and programmed films. “New films for a museum?” asked May, doing the best she could with this third-rate Nichols stand-in. As the director’s cut of Ishtar played, the crowd was split evenly between rabid fans who felt obliged to titter at every moment (even the moments that weren’t intended to be funny) and those who watched with a quiet yet somewhat disappointed curiosity. David Schwartz — the dopey interlocutor who wanted May to discuss how certain aspects of her work were “part of the discovery” and who offered such profound insights as “you really feel that these two are meant to get together” — didn’t have the guts to follow up on some of the more pivotal topics, such as the kind of material that might have lured May back to the director’s chair. “You have to be offered a movie that’s worth your time,” said May. “And I haven’t been.” Schwartz was too timorous to pursue further. Judging by the precise manner in which May outlined her science of comedy (“If you’re going to do a a funny scene when someone gets killed, the gun jams. The finger gets stuck in the trigger…”), it appeared that the reticent May was eager to talk about comedy rather than be subjected to vapid adulations. “It’s hard to know how to respond to a complaint, isn’t it?” said May halfway through the colloquy. If there was a slight hauteur to her answers, there was also a carefully concealed humility. She seemed genuinely touched that so many people came, even underreporting the audience tally. “Either you like the movie or I’m very sick,” she said minutes after the curtain went up. Of Ishtar‘s songs, most of them written by Paul Williams, she was proud to point out that she had written the worst of the bad lyrics. May came into film directing entirely by accident. When she wrote A New Leaf, she had merely sought directorial approval. When her manager Hilly Elkins told her that Carol Channing was up for the part that she would play, pointing out that the studio wouldn’t give her approval but would let her direct, she decided to do it. There were a number of quick questions from the audience. Does she see movies today? She sees many and especially liked The Hurt Locker. She mentioned that some actors had recently asked her what she was doing. She replied, “Nothing.” But this was akin to announcing that you havecancer. “No one had ever said, ‘Nothing. '” May is compelled to work these days when hired for scripts (“a good way to work”) or when she happens to write a play. Of course, an event like this isn’t organized unless there’s a very good marketing reason. There have been past rumblings about Ishtar getting a Blu-ray release, but May revealed that Sony told her that they didn’t have a Blu-ray film to show. The audience last night was shown a so-so print (although I can report that the red headbands worn by Hoffman and Beatty made a serious impression). This suggests very highly that a transfer has not yet been made and that much of the online conjecture — most of it promulgated by aging lunatics harassing Warren Beatty, Sony, and various people who work for Mike Nichols — is unsubstantiated. Will Ishtar be released on Blu-ray or DVD?